I love to peel and stick things. Especially orange things. Here's an easy way to customize plain ceramics: apply decorative tape in colors that match your home, your party decorations, or your current bouquet of flowers. Dress up inexpensive vases for DIY wedding table centerpieces or showers. And when you get tired of your design, just peel it off. 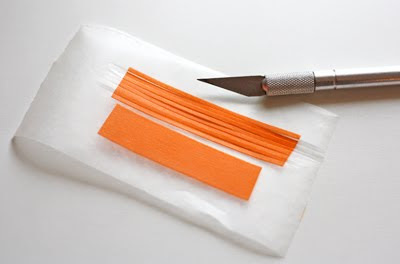 Stick tape onto a piece of wax paper and slice it into thin strips to make asterisks or bunting strings. Cut the other shapes off tape rolls with a scissors. BTW,Do you have the name/brand of a good ORANGE PAINT color? 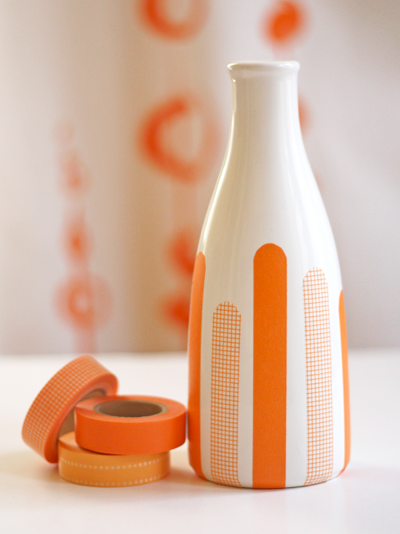 I want to use orange as the accent color in my sewing room.. I must invest in some plain white glassware. What a great idea! 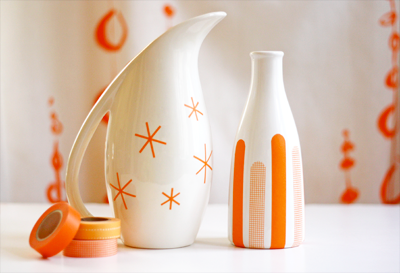 Going to have to fight Nancy for that jug - it's absolutely gorgeous! Thanks! The pitcher was a vintage Etsy find. The other vase was about $2 at Walmart a couple years ago. I think it's supposed to be for salad dressing; it was with the plates and dishes. It would be fun to get a bunch of them and do a row of vases, or put one on each table at a reception. FOR THE LOVE OF ALL THAT IS CUTE. So cute! I particularly love the bunting. This is SUCH a great idea. I had linked to your mother's day cards on my post today (all about your fabric), but I'm off to change it now to THIS link. Fabulous! what a cute idea!! i have just the vase i'd like to see cheered up with polka dot tape. Nancy, there are many excellent oranges, so of course it depends on what you're after. But I can tell you we painted two walls in our spare bedroom Behr 250B-6 Poppy Glow. this is so awesome, jess! thanks for sharing it. Love the tiny strips and bunting =) Oh, and of course your new fabric line Outside Oslo! What a creative idea! I love the fact that you can switch up the look of things whenever you want! I've just discovered decorative masking tape, and I can't wait to use it on something! That bunting one is especially awesome!!! Awesome idea! Did you use a corner rounder or free-hand cut those curved ends? This is too cute! And so easy! That bunting pitcher is adorable! This is very inspiring. It all looks amazing! a great idea, as usual !!!! awesome ! Ok, I'm pretty much drooling over that last one with the bunting! So cute!! What a cute idea! I love it when you can decorate then redecorate items to make them fit any occasion. Of course, it makes me sad that none of these would survive even a single washing, but... At least you get a fresh canvas! I will do this on every single ceramic thing i own. Oh my lordy, you are just so clever! Monika, those are awesome! Love them. This is fabulous. I am sharing your idea on facebook with all my friends. I love it! Illustrating in one post why I love this blog so much. So cool. Bet it would look great in any color! Have you tried others? What a good idea. And so cheap to do! The bunting is particularly nice. I have a slight obsession with MT Tape so I was so thrilled to see it used in such a creative way! I absolutely love the things you do with decorative masking tape! What a great idea! Thanks for sharing your favorite places to find tape, I am on my way to check them out. Shut UP! This is brilliant. Where does one find orange masking tape?? Love it! This is the first truly unique usage of the Japanese masking tape that I've seen in a long time. Simple and beautiful! Is that really amsking tape?? When I think masking tape, I think the whitish yellowish stuff you get from the store....is this the japanese masking tape?? it is fabulous! Does it have a shiney finish, or more matte and textured like traditional masking tape? Yep, it's the Japanese stuff. It has a matte finish and is thinner/more flexible than the regular manilla-colored traditional masking tape. 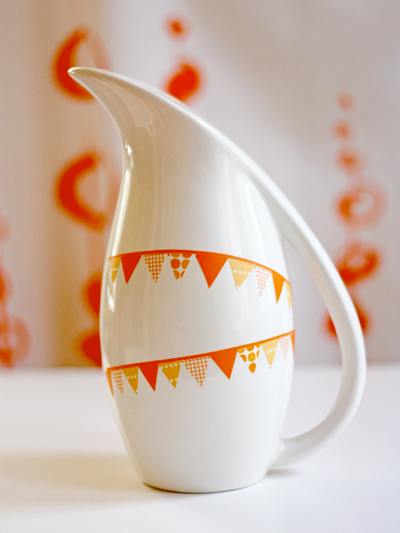 the bunting jug is amazing! So beautifull. Thanks for the ideas. That looks amazing. I'd probably fail and be uttlery frustrated in trying to make mine look just as pretty but it's such a great idea! Wow those are so great!! Well done on the bunting, must have taken forever. Nope, just a couple minutes. Quick snips with the scissors off the ends of the tape rolls, cutting on an angle to make triangles. Oh my goodness... I'm seriously always so impressed with you! Who would have thought to use decorative tape to decorate?! You're seriously so incredibly creative... keep it up!! So glad to have stumbled upon your site. I have a lot of reading to do. The cutest tape decorating I've ever seen. The last pitcher is my favorite!! Sooo cute! Thank you for the idea! I love the 1950's looking star burst pattern! My mind is spinning with ideas. THANKS! hey i need to decorate a cup made of plastic. Any ideas?